Sachsen/ Leipzig, Ende 18. Jahrhundert. Saxony/ Leipzig, end of 18th century. Two-part softwood structure with honey-coloured plum veneer and rosewood and walnut burr inlays. 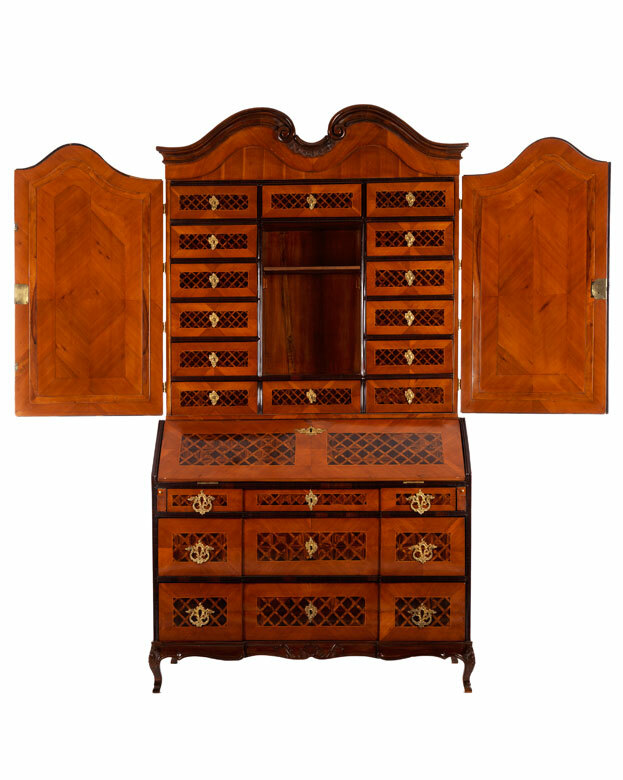 The substructure in the shape of a commode with two taller and one narrower zone of drawers with a recessed central section. 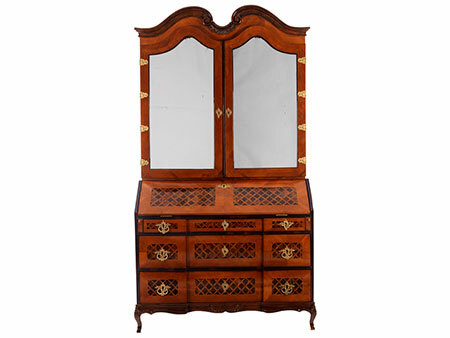 Pedestal carved with relief décor and short curved legs. The angled drop-front desk is decorated with fields that follow the structure of the drawer fronts beneath. The dark fields are veneered with rosewood and walnut burr cube marquetry framed by pale thread inlays. The sides of both the substructure and the upper cabinet are also decorated with fields of dark thread inlays with semi-circular light and dark corner rosettes. The tall two-door cabinet with applied mirrors crests with a symmetrically curved gable, recessed at centre, with coved cornice and symmetrical volutes rolling inwards. 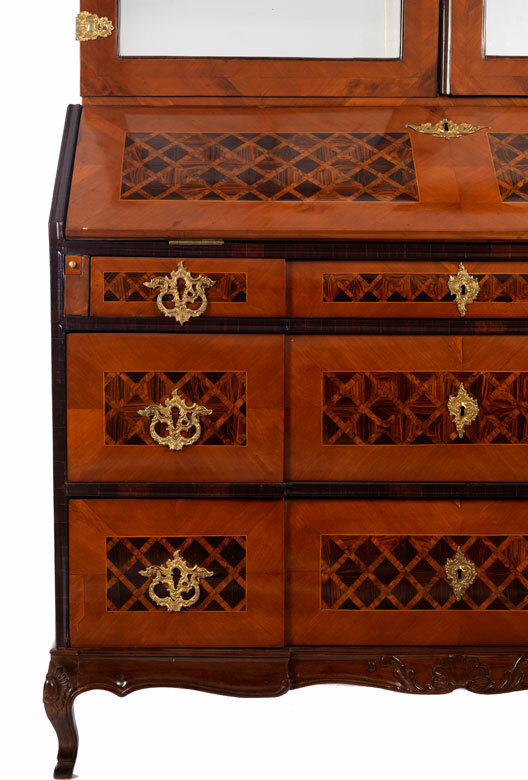 The inside of the bureau is equipped with five straight drawers decorated with plain fruit wood veneer as is the drop-front desk. Here, it is especially the decoration of the hinges and escutcheon in gilt-brass with fine geometrical engraving that is effective. 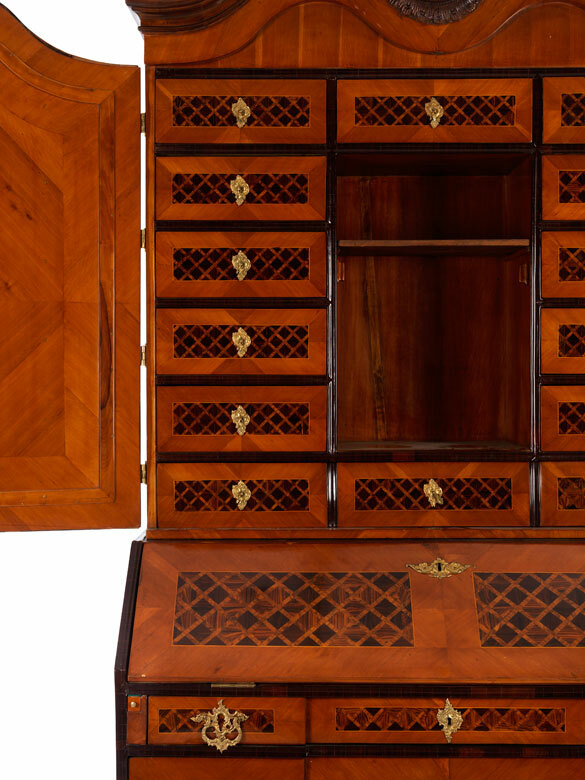 The cabinet has 14 drawers in total grouped around a tall rectangular central niche, which is, just like the exterior veneer, also adorned with parquet fields. 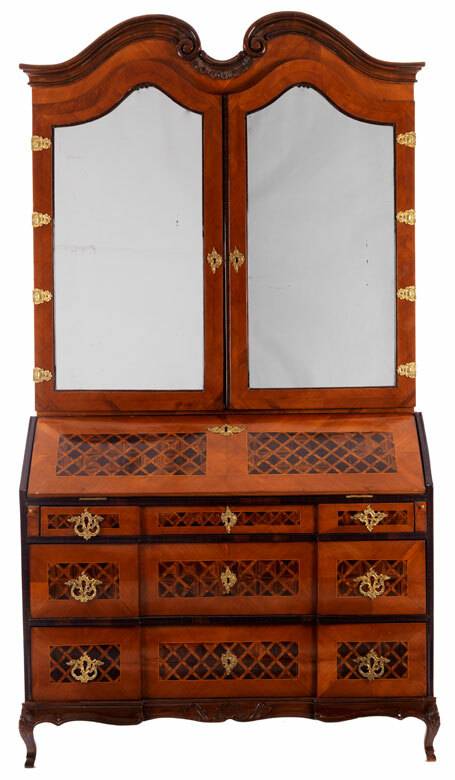 The cabinet is adorned with very finely crafted elegant and beautiful gilt-brass mounts, whereby the four door hinge mounts on either side together with the escutcheons and the pull handle mounts on the inside, form an aesthetic unit. In overall good condition.